Yamakase recently opened, and they call it an “invite-only” restaurant. It’s not hard to get “invited”, though. You just fill out a form online on their website, and they’ll reply back with an “invitation” soon enough. The restaurant’s pretty hard to find, and parking was annoying. It’s street parking–only, but, if you’re like me, you’ll just park in a nearby lot and hope that your car doesn’t get towed away. Once we arrived at the restaurant, we had to knock. There’s no sign, and it even says “closed”. They even lock the door hahaha—it was pretty shady. The meal was wonderful. Chef Yamamoto seemed a bit strict at first, but you realize a few minutes in that he’s a really, really nice guy. He’ll also like you more if you’re really enthusiastic about the food. 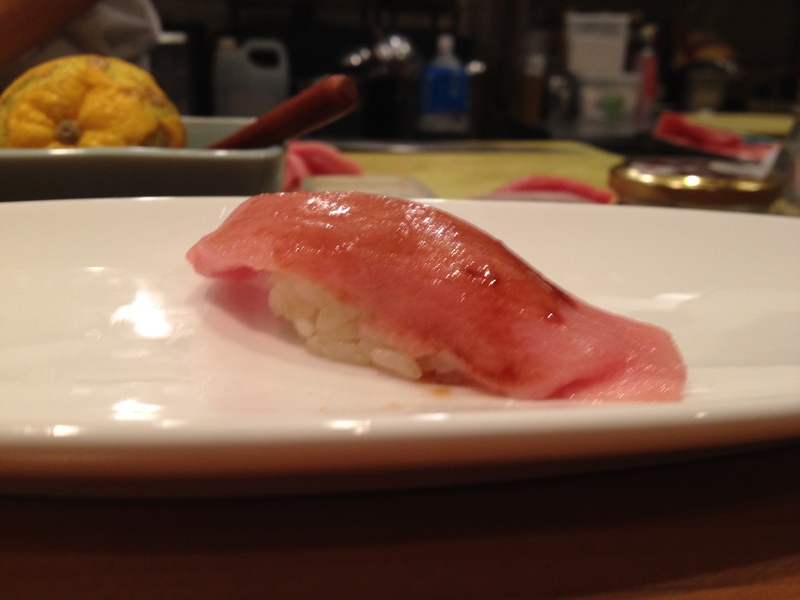 (He seemed a little offended when one of the customers near us wouldn’t eat the rice when he was serving nigiri.) 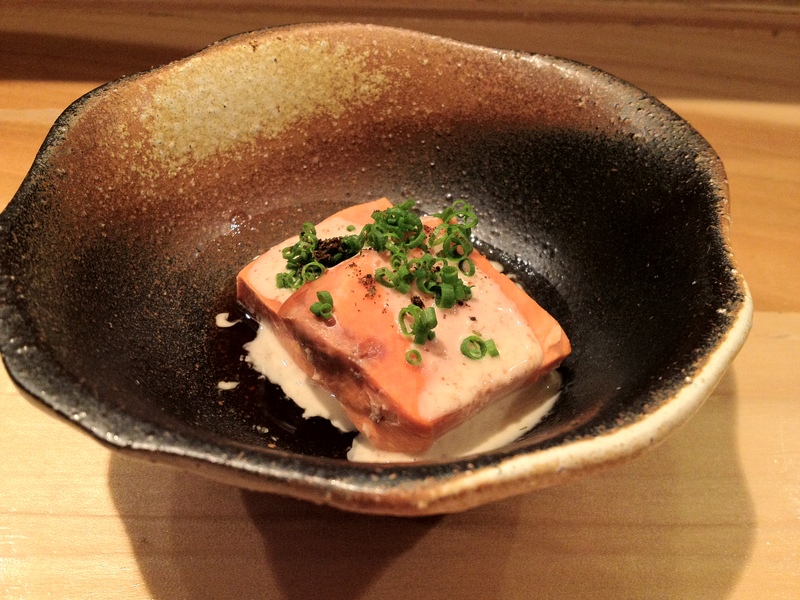 It was one of those meals that reminded me of Urasawa—you could chat with the chef a lot and even drink with him! The rice was even warmer than Sushi Zo’s, which was kind of a con for me. The rice was similar to Sasabune’s rice in NYC when I went; I have to admit that the rice was really soft and fluffy, though it did break apart easily once or twice (a problem that Sasabune also had). It did feel a little inconsistent at times, though—for a few pieces, the rice would at times feel slightly grainy, but this particular issue wasn’t too big of a deal. 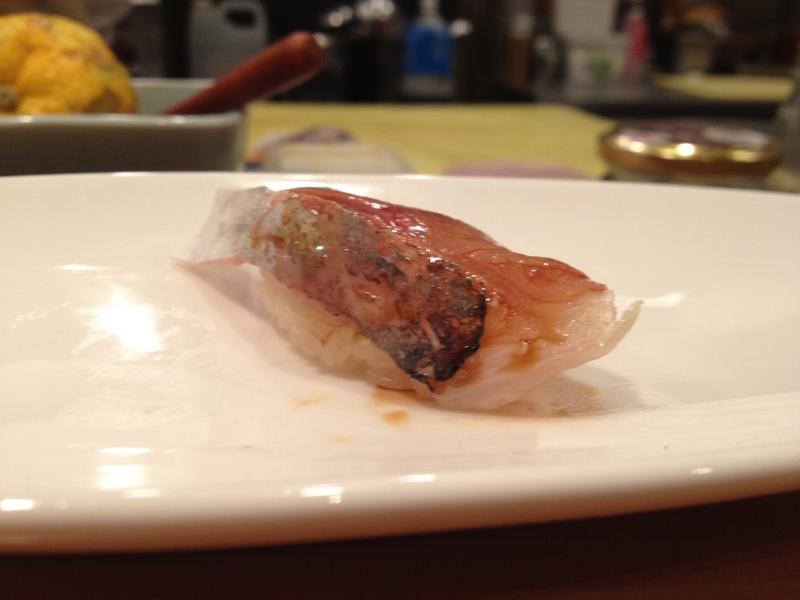 The fish was VERY fresh, and it seemed like nearly all of his ingredients came from Japan. 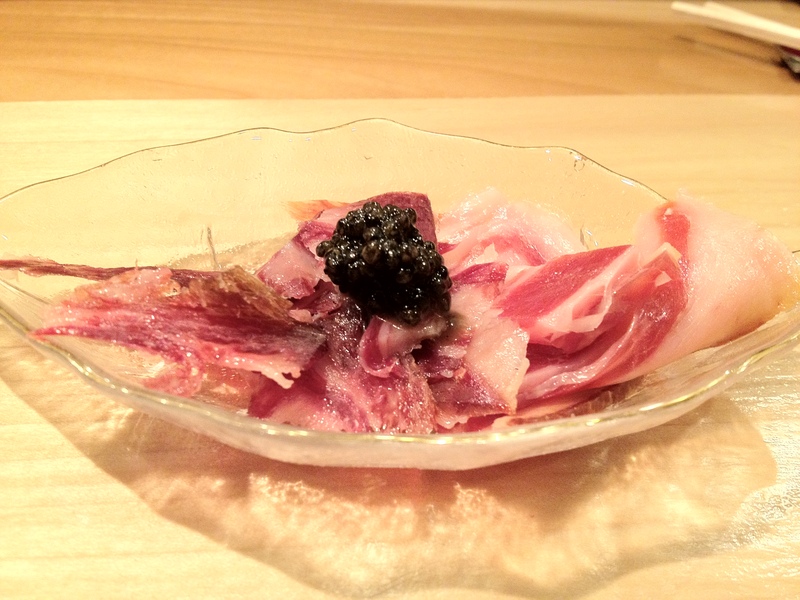 Jamón ibérico de bellota ham by Fermin with Royal Osetra caviar. 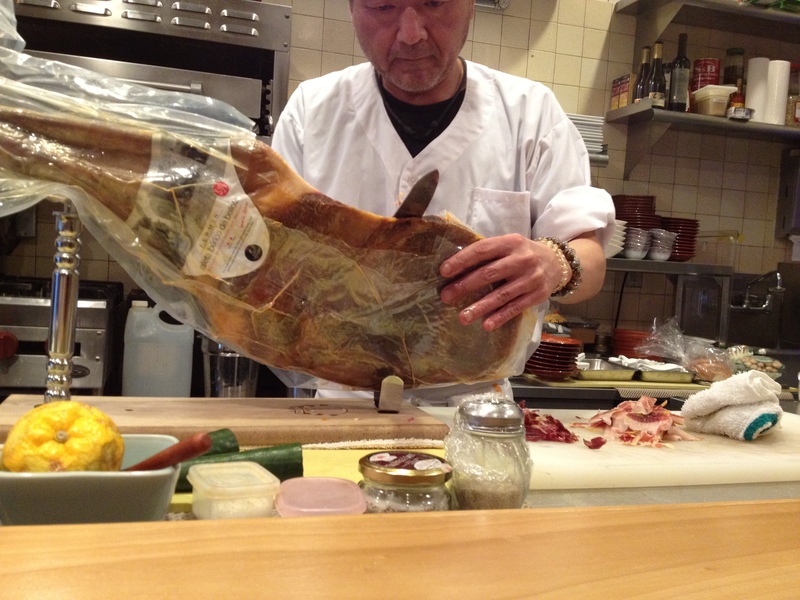 Chef Yama’s preparing the slices of jamón ibérico ham here. The ham was very flavorful and chewy. The pieces were a bit thicker and tougher than other cured meats (especially Italian ones), but I actually like the feeling of chewing this more—it reminded me of bakkwa, which I LOVE and ate a lot of growing up! The caviar made it a bit more decadent, but it honestly may have been slightly detrimental in that it made the dish noticeably saltier. 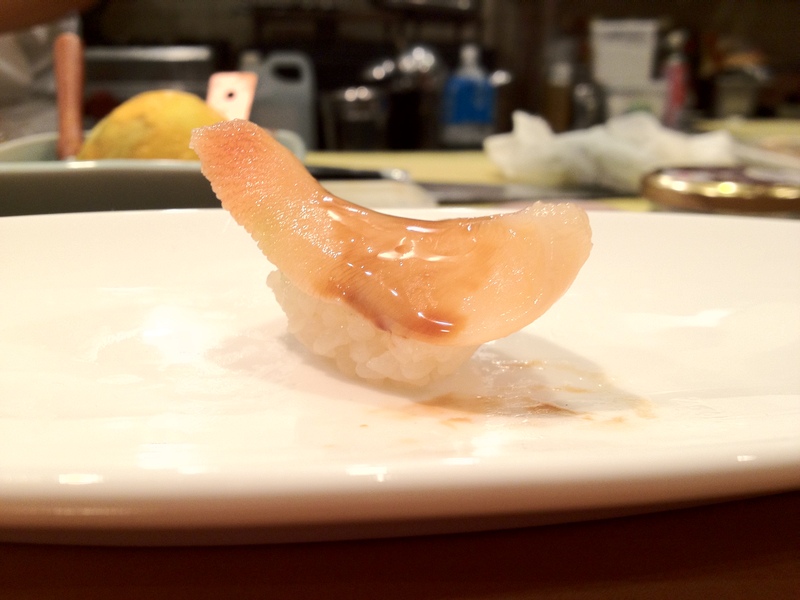 Baby anago (saltwater eel) from Shizuoka, Japan; sesame sauce; and Japanese baby peach. Apparently, the season to get baby anago is nearly over, so it’s really hard to find these now. 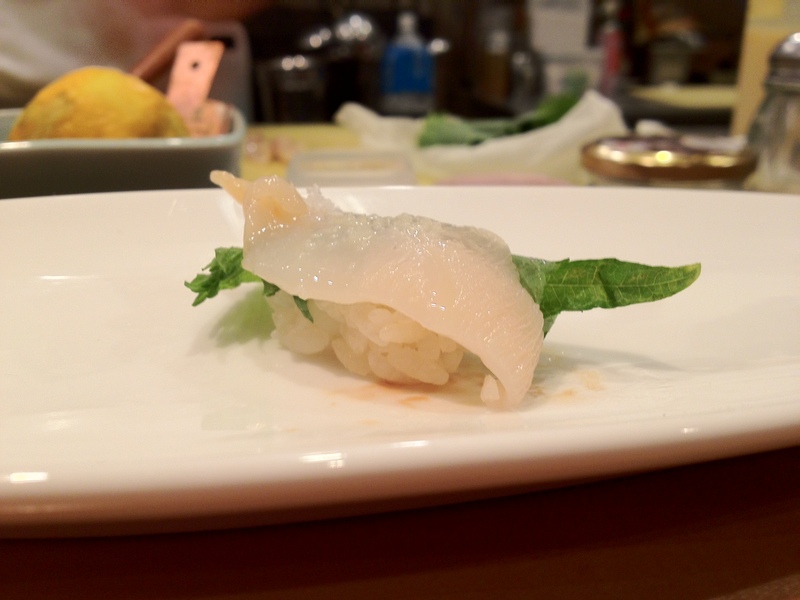 The baby anago weren’t too flavorful and had the texture of jellyfish—I think I prefer adult anago more. The baby peach was fresh and served as a wonderful way to cleanse my palate after finishing the anago, though! 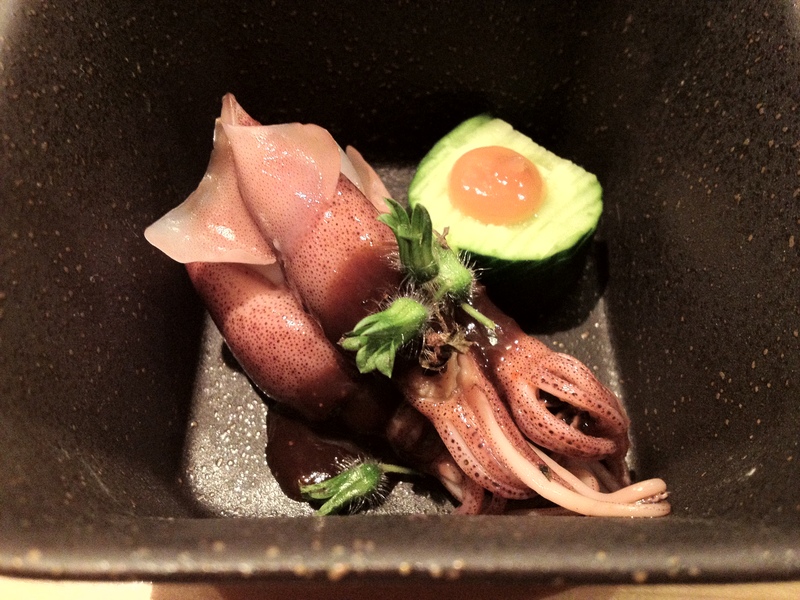 Baby squid with cucumber and plum sauce. The cucumber had small cuts to make it softer when chewing it. The squid were a lot smaller than this; I took my pic really close so that you can see it with better detail haha. 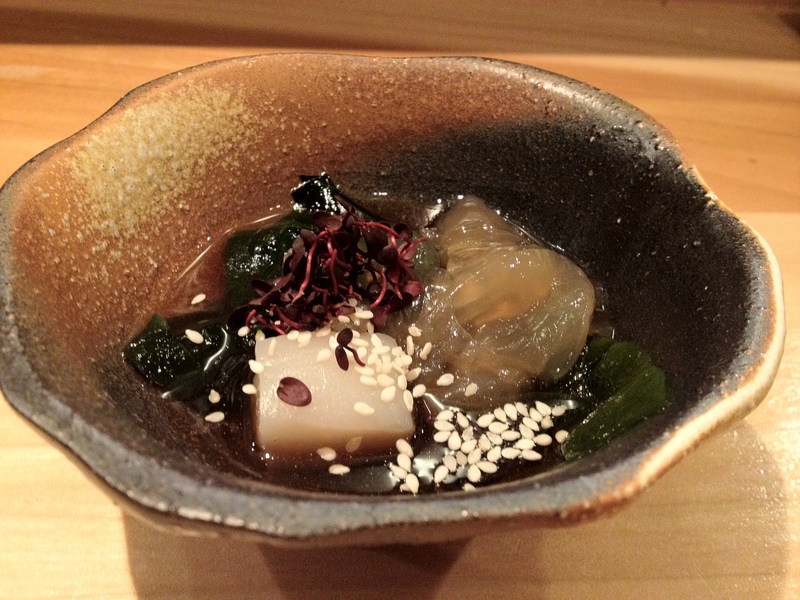 Tairagi scallop from Japan, jellyfish, wakame seaweed on the bottom, and spicy sprout on top. Speaking of jellyfish (from Entrée 2), yay! Jellyfish! (They didn’t really taste better than other jellyfish I’ve had in Chinese seafood restaurants, though…) The scallop had a firmer texture than normal scallop, and it had a very sweet aftertaste. 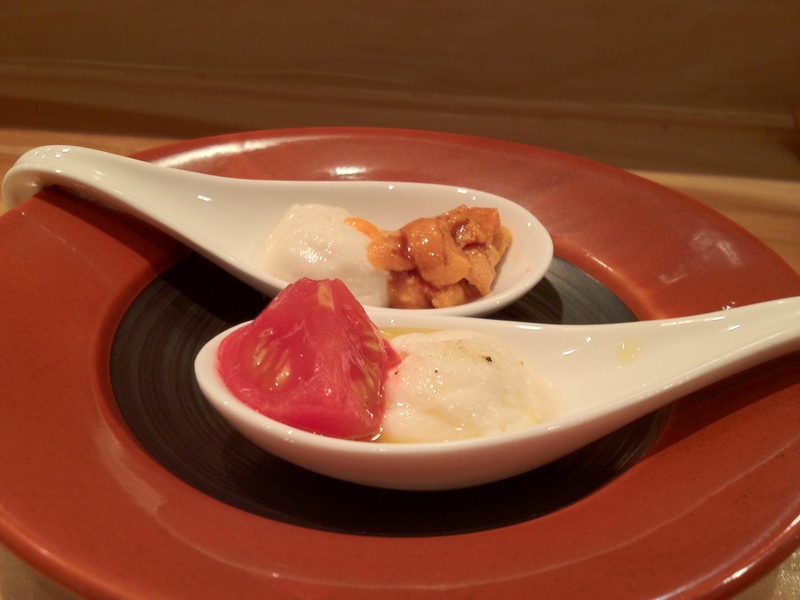 Front spoon: Tofu from Kyoto, Japan, and marinated tomato with olive oil and truffle salt. Back spoon: Tofu with bafune uni from Hokkaido, Japan. I thought that the tofu was excellent and very fresh, and the tomato and uni provided nice background flavors to the tofu. This was a really creative dish, but it didn’t make us go OH-MY-GOD-IT’S-SO-DELICIOUS. Icefish wrapped with cherry blossom leaf and served with plum sauce and spicy sprout. This smelled wonderful, like cherry blossoms! Chris thought that this was his least favorite so far. Then again, he added the disclaimer that he doesn’t like the taste or texture of icefish. 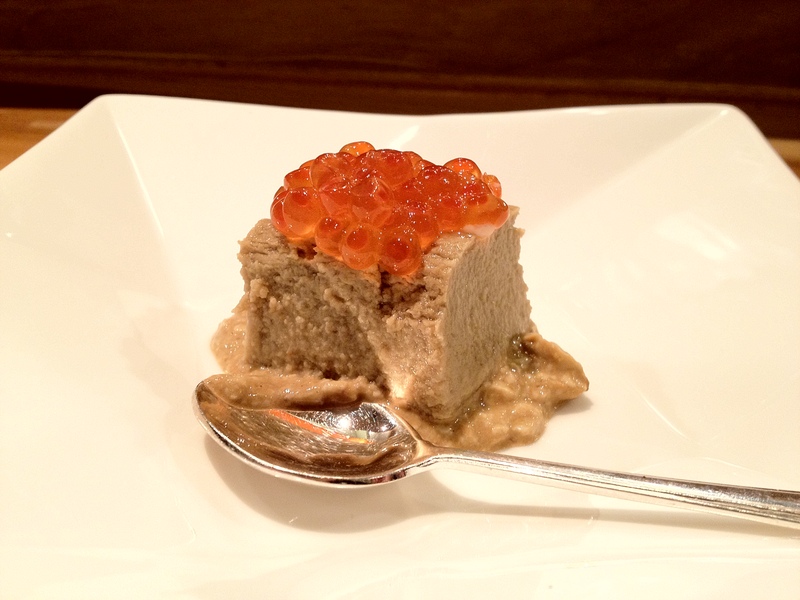 Steamed Japanese ground yam potato with crab guts inside, ikura (salmon roe) on top and additional hairy crab guts on the bottom (as a sauce). I’m not exactly sure how he prepared this. The yam had the texture of tofu but the taste of yam. (Maybe he mixed it with tofu, and I just misheard him. Hmm… If it was mostly tofu, then I would bump this dish’s rating down to a 2.) The crab guts and ikura added some sweetness and creaminess, and every bite was a relatively small amount of food that packed a giant, decadent punch of pleasure. 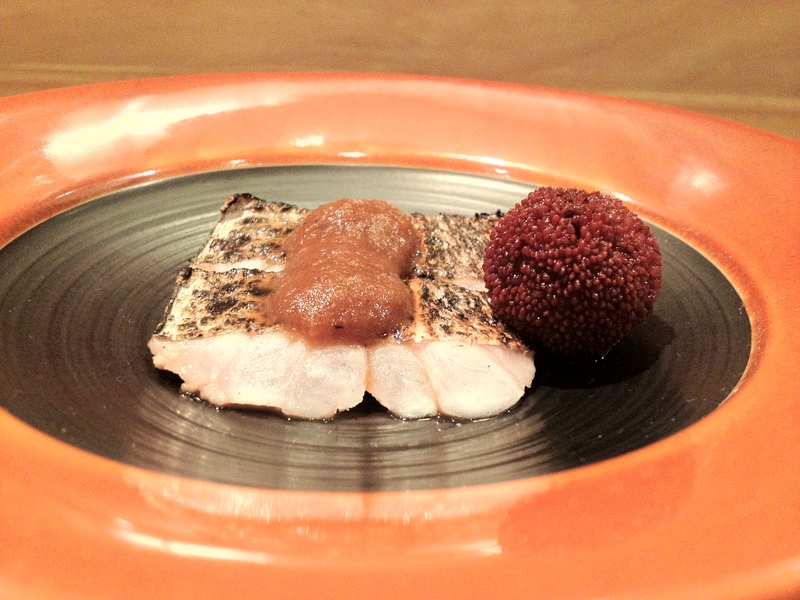 Ankimo (monkfish liver) with black chili, ponzu, sesame sauce, and chives. Seared beltfish with a sauce made from soy sauce, mayo, and onion. Served with mountain peach on the side. 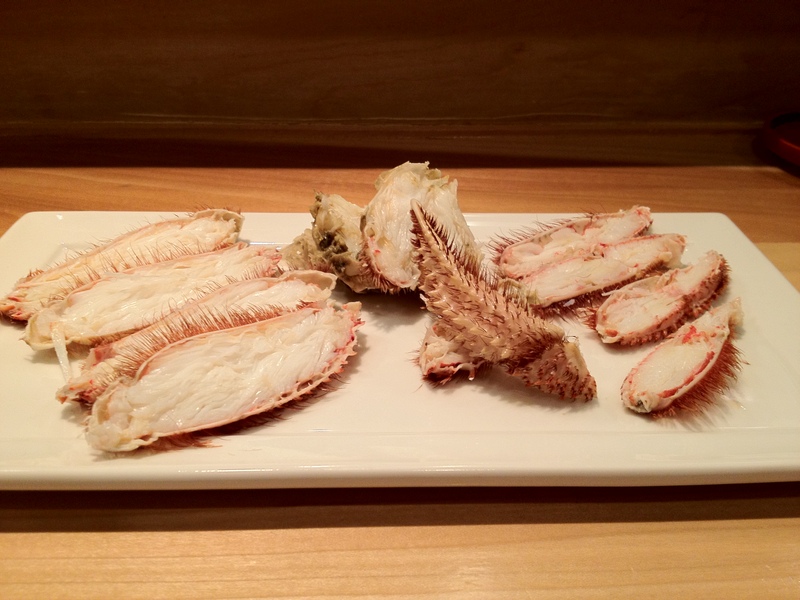 Steamed hairy crab from Hokkaido, Japan. 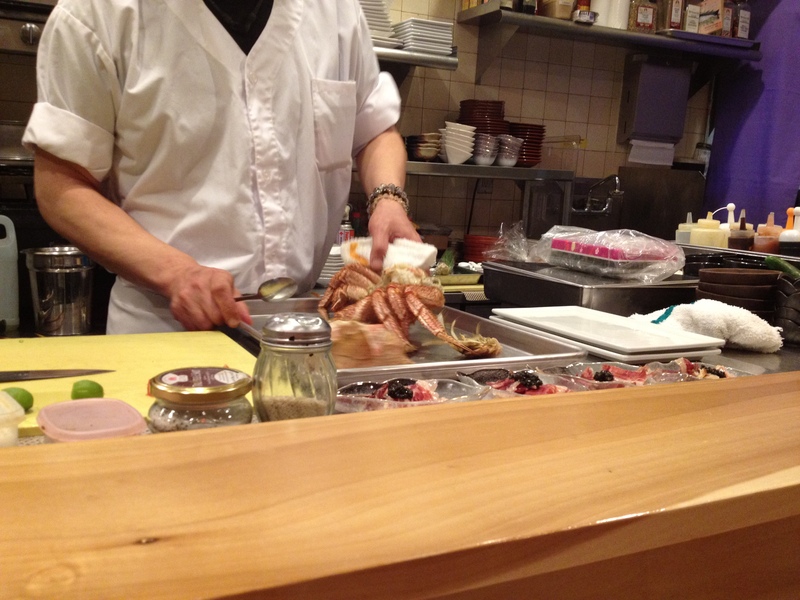 Chef Yama is preparing the hairy crab for four of us here. This felt a little boring and uncreative. Sure, it was a little interactive—at the same time, the hairy crab didn’t taste that amazing to us. Maybe I need to improve my palate for crab. Hmm. 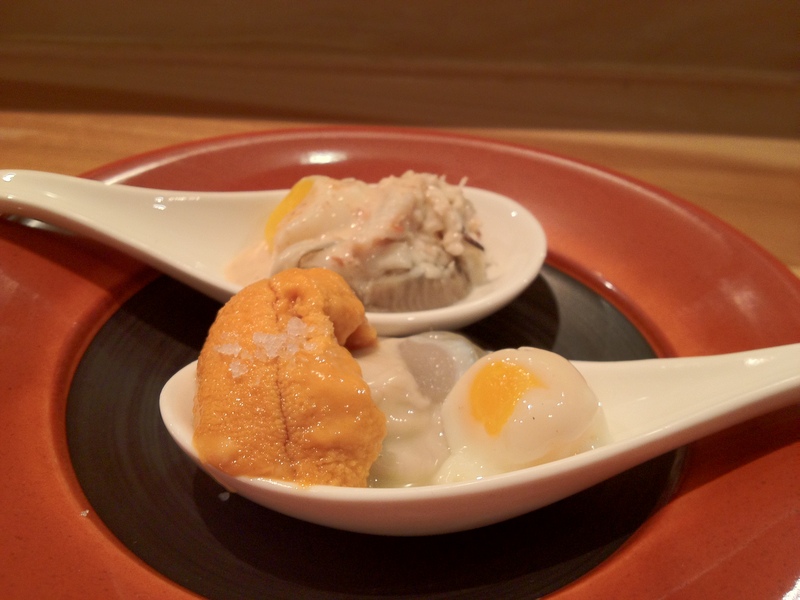 Front spoon: Uni from santa barbara with Kushi oyster and poached, truffled quail egg. The uni was good, but the back spoon was even better. Blue crab, blue crab, blue crab!!! Why the heck does blue crab make me so happy right now?! 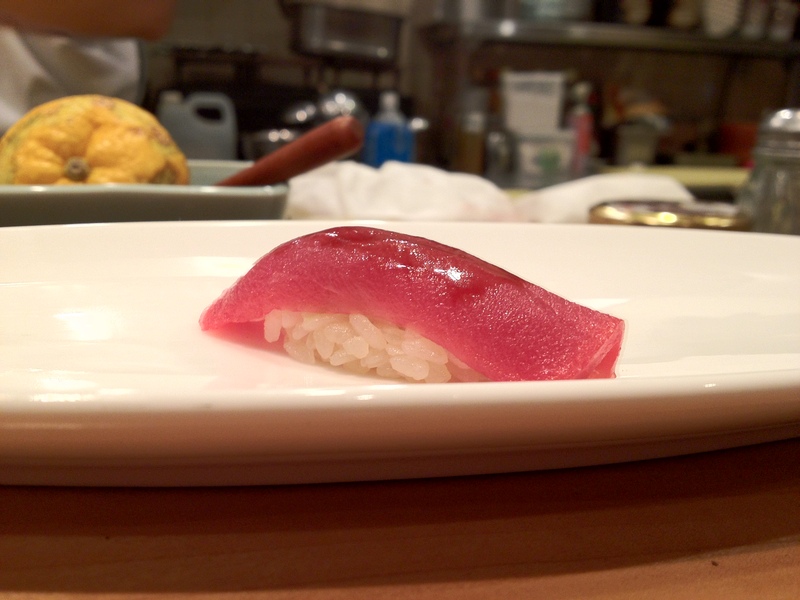 Bluefin tuna, from Spain, with soy sauce. 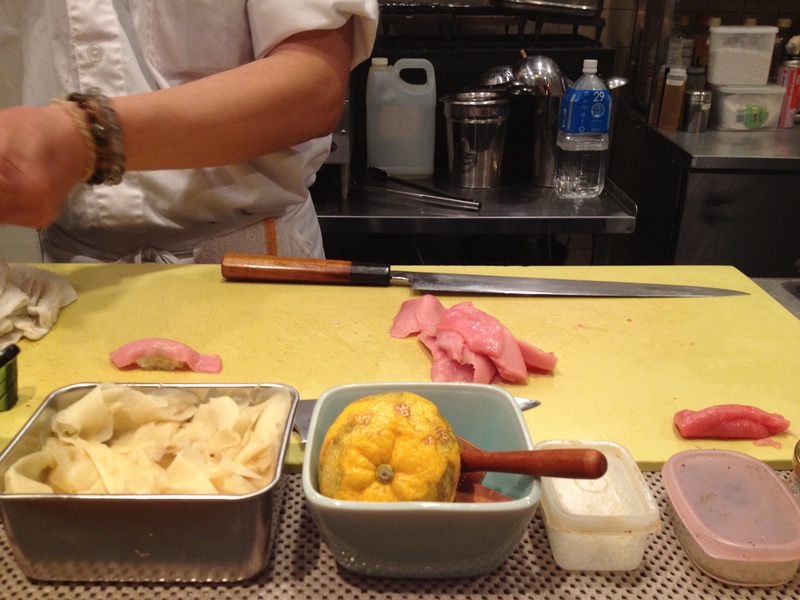 Chef Yama is preparing the pieces of Bluefin tuna for us here! Chris and I thought that this was way too salty. 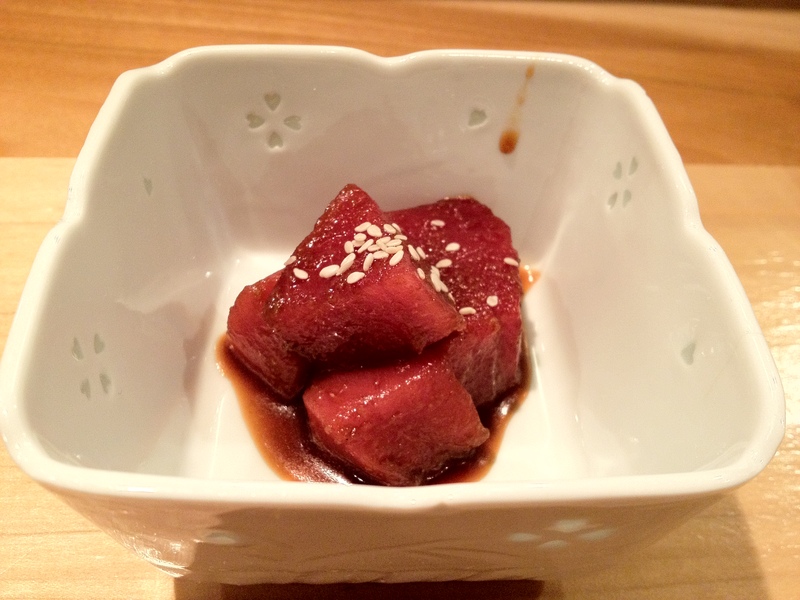 I actually wouldn’t mind eating the bluefin tuna with just a few drops of soy sauce (or even with no soy sauce). It’s bluefin tuna! I’d be happy just biting into a chunk of it hahaha. 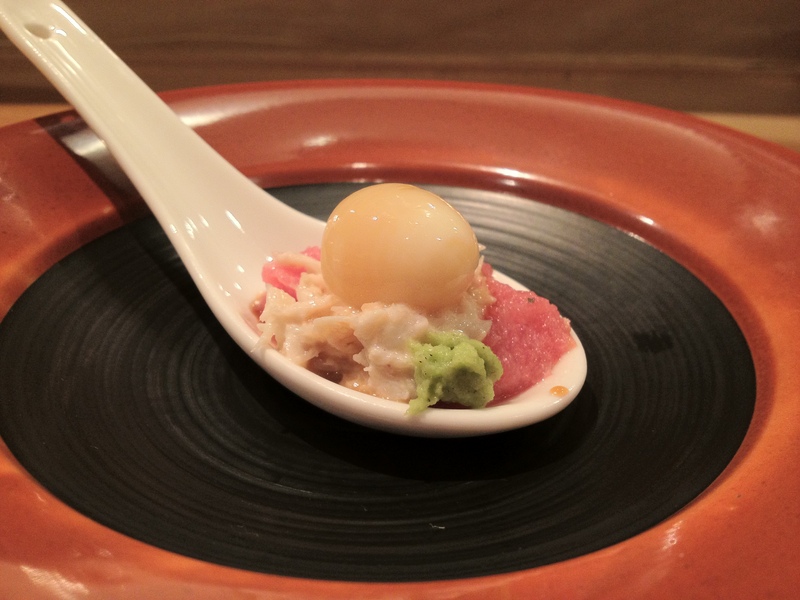 Bluefin toro tartare with blue crab, quail egg, and yellow wasabi on the side. I thought that there were too many ingredients and things going on—I think it would have benefited from having one fewer ingredient. As a result, the dish was merely great when it could have been amazing. 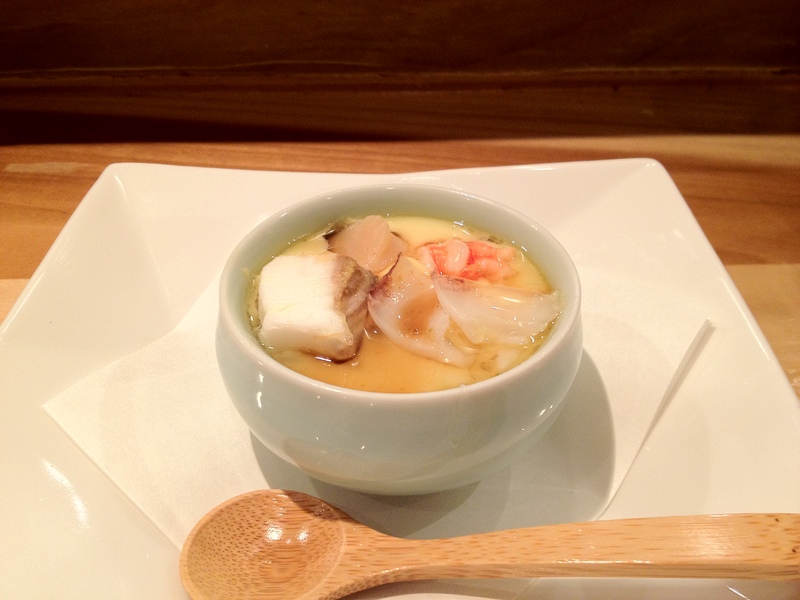 Chawanmushi (with shrimp, scallop, monkfish liver, and… sea bass…?). Seared wagyu tenderloin from Kagoshima, Japan. 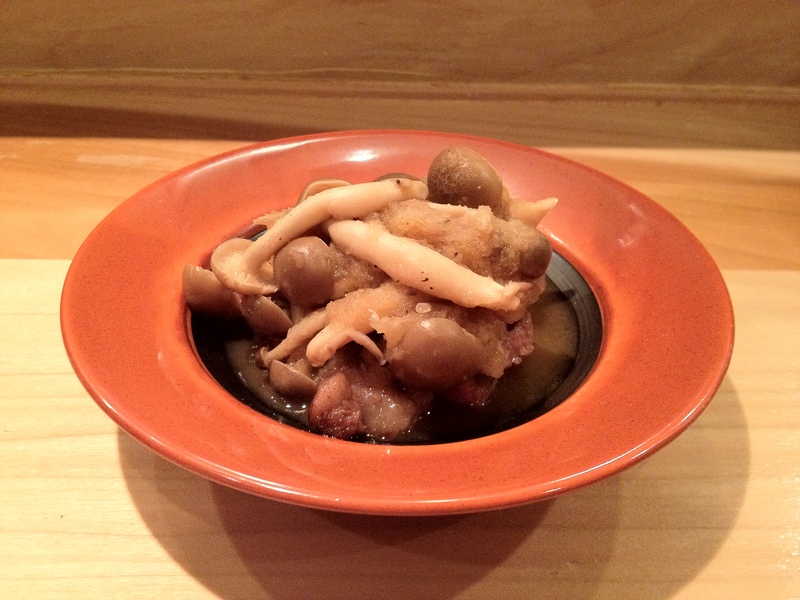 It was dry-aged for three weeks, and it’s served with matsutake mushrooms and a daikon sauce. 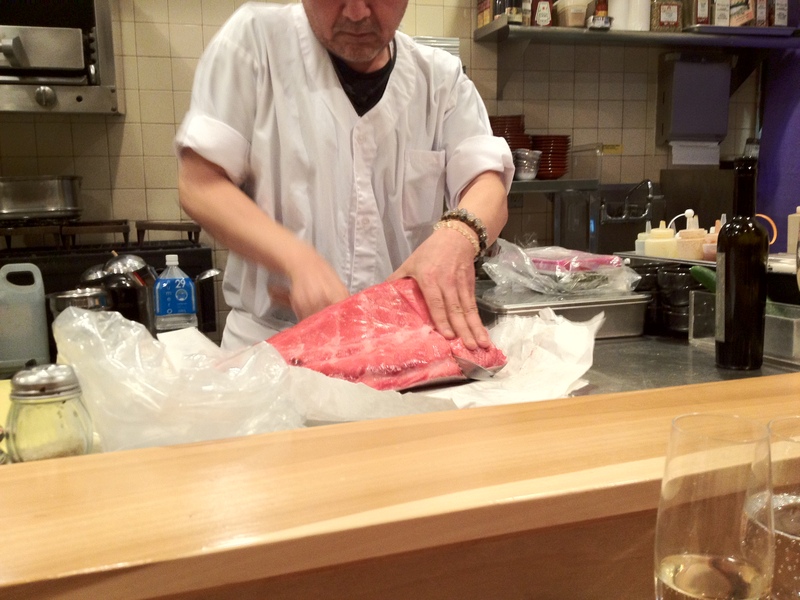 Chef Yamamoto’s cutting the wagyu for us here. I… think I would have been able to eat all of that (if I hadn’t eaten Sushi Zo three hours before haha). It was THAT delicious haha. 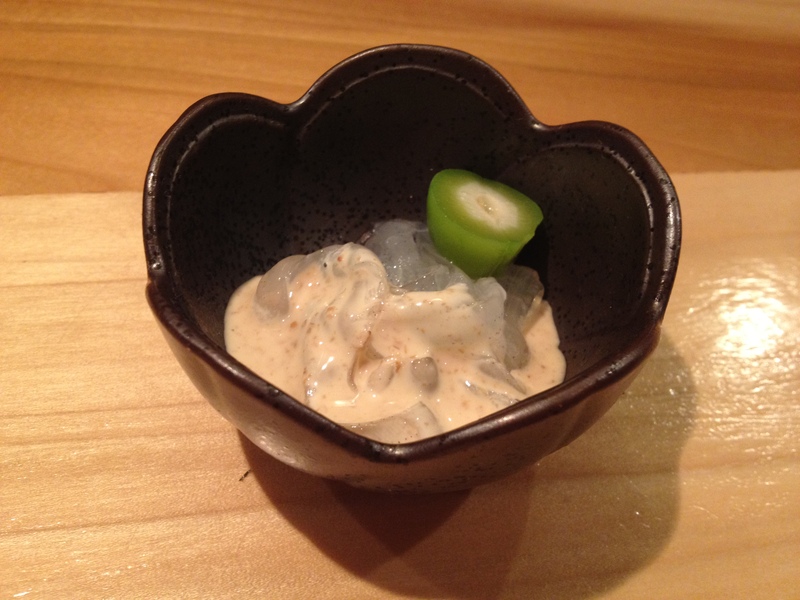 According to Chef Yamamoto, the hot sauce is meant to cook the wagyu slightly more. I asked Chef Yamamoto why he didn’t sous-vide the wagyu, and he said that he’s been experimenting with the proper sous-vide settings to get perfect wagyu. He still hasn’t been able to find the perfect settings, though, so he’s sticking with normal searing for now. Apparently, there’s been a lot of taste disparities for the same sous-vide settings; different areas of ribeye, for instance, have tasted similar when cooked under the same sous-vide settings. The wagyu was DELICIOUS. I thought that the matsutake mushrooms and daikon sauce were completely unnecessary, however. Just give me that tender, soft, and delicious wagyu—and leave everything else out so that I can focus on the gloriousness that is Kagoshima wagyu. The rice is definitely soft and fluffy, but it’s too warm—it was just as warm or maybe even SLIGHTLY warmer than Sushi Zo’s rice. The rice was soft but felt a little grainy here. Again, I thought it was too warm. 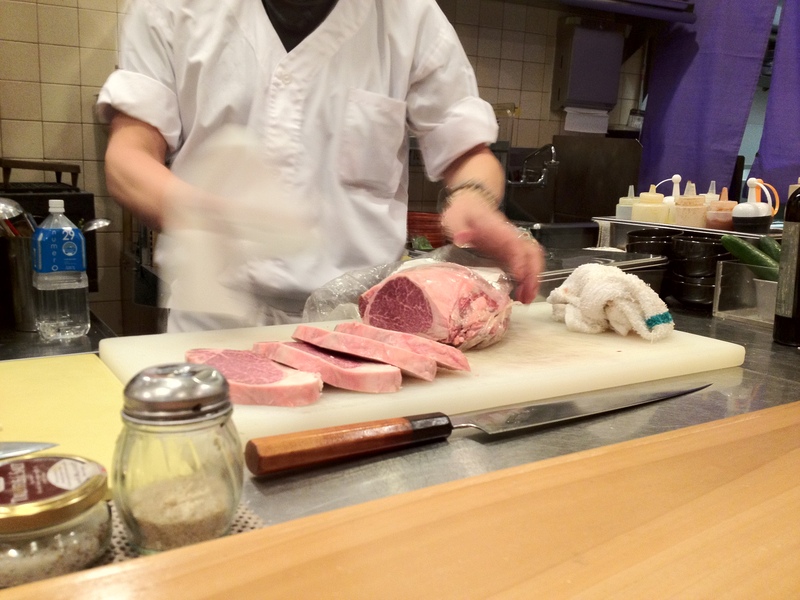 He cut extra slices of ōtoro so that we could get extras. …Each of us got another piece hahaha. How are we supposed to refuse ōtoro?! 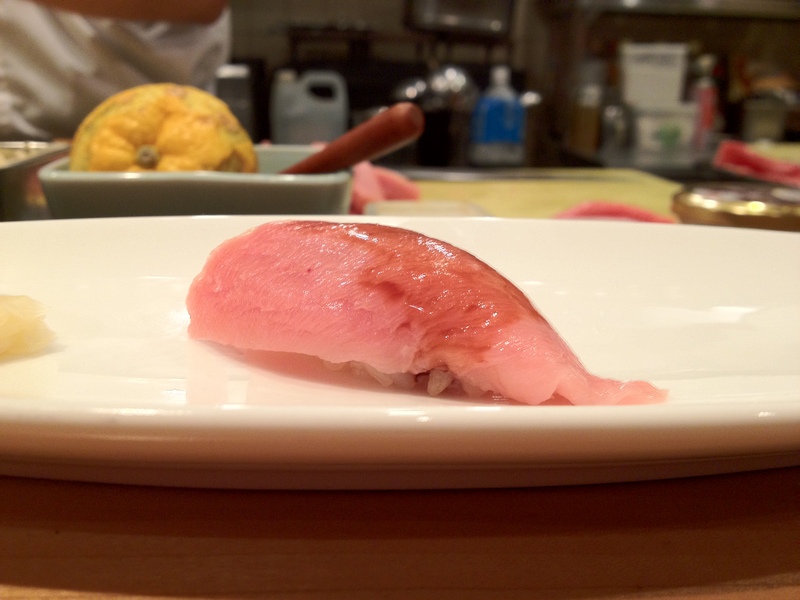 According to Chef Yamamoto, this fish is very special and is harvested in only two locations in Japan: the Ōita Prefecture in Kyushu and Awaji Island. 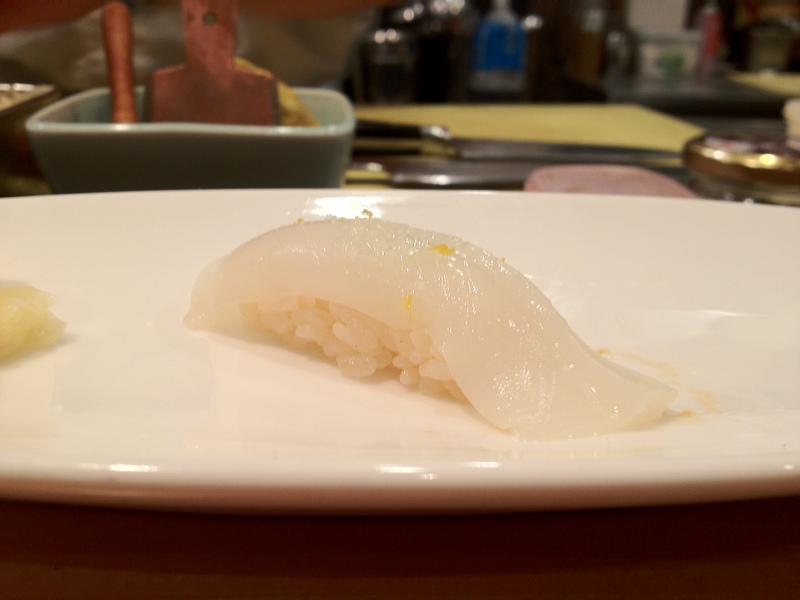 Sumi ika (golden cuttlefish) with yuzu zest and Japanese sea salt. 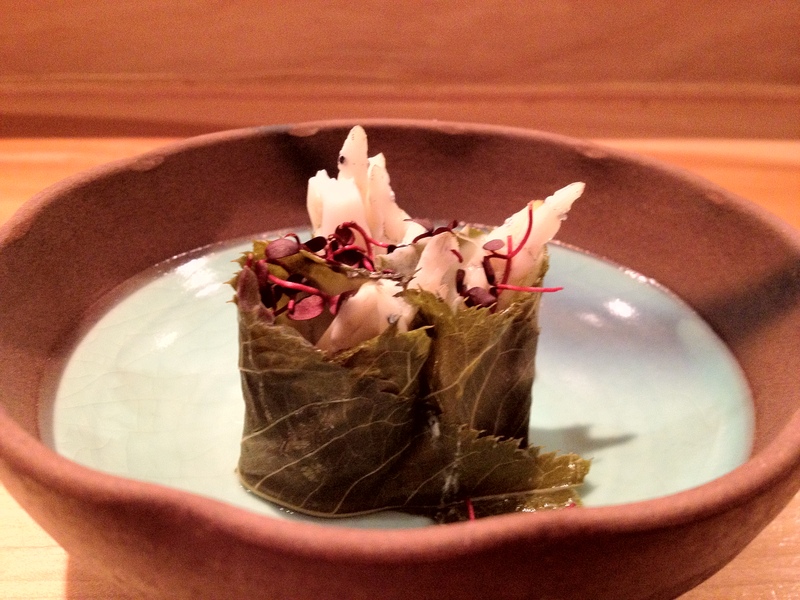 Mirugai (giant clam) with shiso leaf, Japanese sea salt, and yuzu sauce. He was about to give me another piece, but he accidentally dropped it right outside my plate and had to throw it off. THANK GOD. I had wayyyy too many calories today! Toro–and–blue crab hand roll (crispy seaweed, toro, blue crab, shiso leaf, cucumber, and sesame seeds). Chef Yamamoto made me take a bite out of this before taking a picture hahaha. 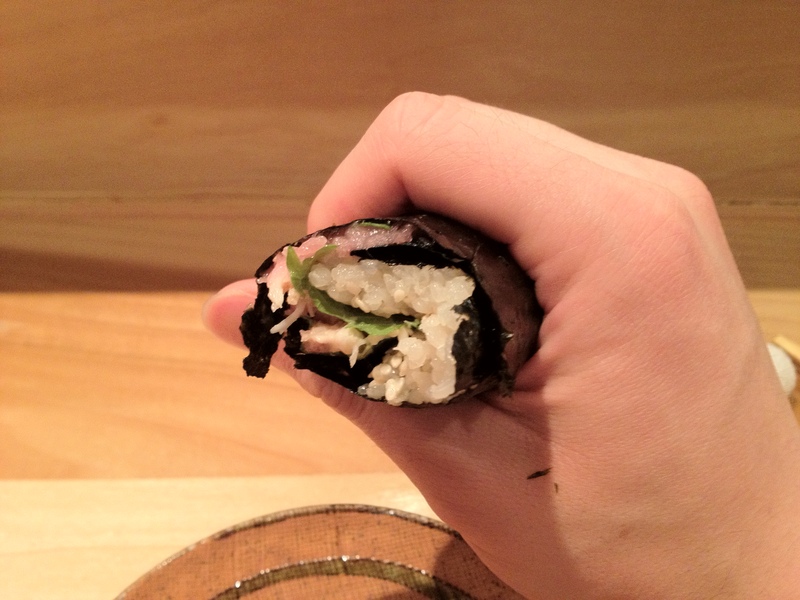 He wanted me to taste the seaweed and see how crispy and flavorful it was before it could get any softer with time. Fresh, crispy seaweed. Shiso and sesame seeds. Fresh, creamy blue crab and toro. MmMMmMMmmmmm. As I mentioned before in the Sushi Zo post, I’m starting to like blue crab hand rolls more than toro hand rolls—there’s just something about the texture and flavor of blue crab that I like more than toro, especially when it’s minced and eaten with seaweed and sushi rice. Combining blue crab AND toro in the same hand roll, though? That definitely beats out either blue crab or toro hand rolls! At this point, Chef Yamamoto asked us if we were still hungry. Naturally, we asked for more food! I was curious to see what else he could give us. Frozen toro, blue crab, cheese from Italy that had hints of black truffle, and flax seed toast. 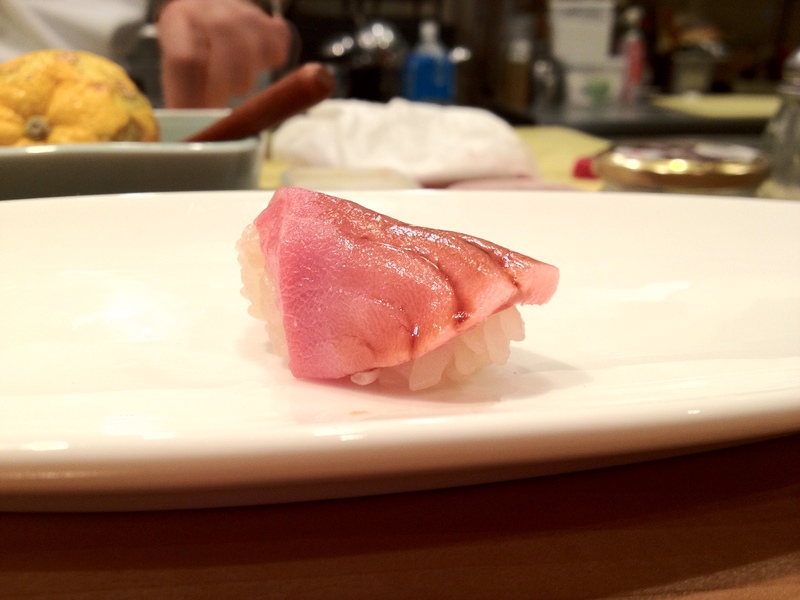 Chef Yama wanted us to focus on the contrast between the cold toro and the hot toast. It was a glorious, glorious contrast. 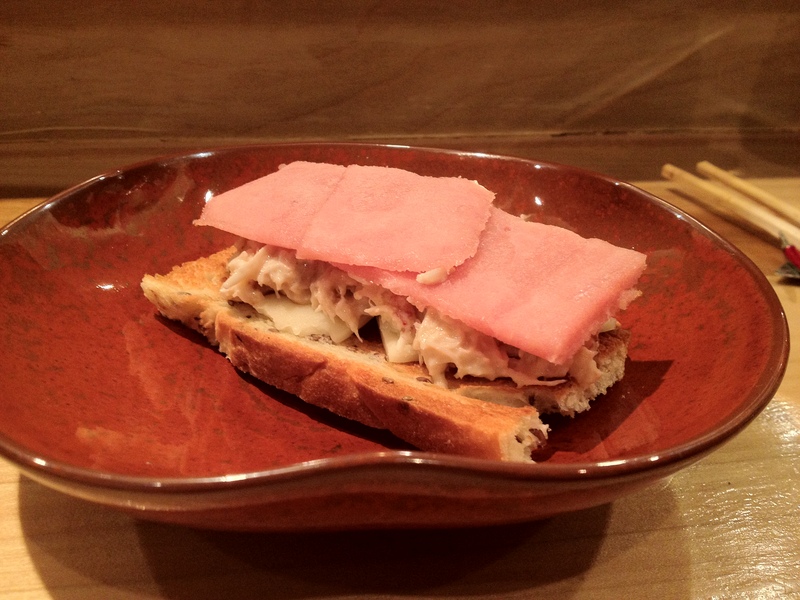 The cold toro mixed wonderfully with the crunchy toast when it came to flavor, richness, and texture—it was like a Japanese hand roll–style BREAKFAST SANDWICH, and it was Montegasmic. This reminded me of how Per Se’s pastry chef likes to do delicious plays on childhood foods. This was the best thing I ate in this meal! It was one of those dishes that make you feel very lucky for having the opportunity to try it. If I could only try one thing from this meal again, this would EASILY be it. It managed to be creative, fun, AND incredibly delicious at the same time. OM NOM NOM. 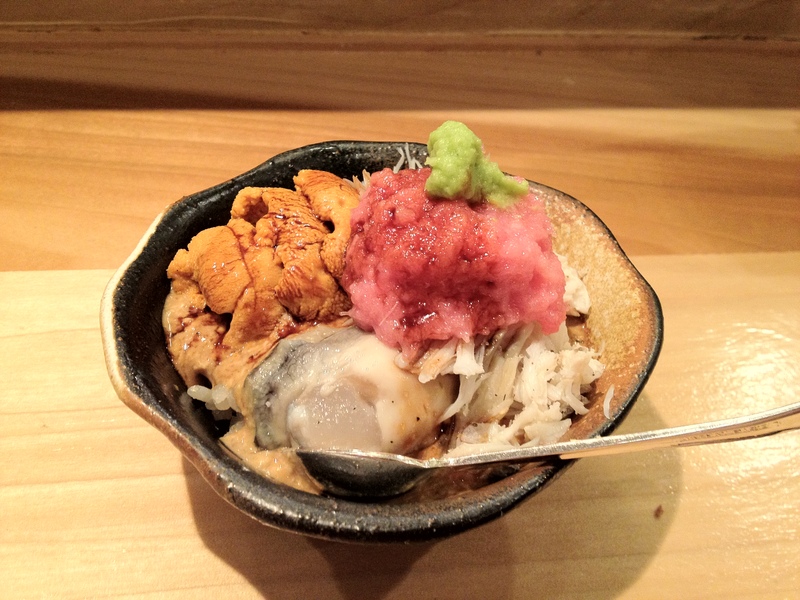 Toro, oyster, uni, blue crab, crab guts sauce, wasabi, and rice. Everyone else was full by this point, so this next dish was just for me. He called it the “New York Special” (I told him earlier that I was visiting from NYC.). This name was incredibly fitting. It embodied New York City in so many ways. Just from reading the list of ingredients, you can probably tell how it tasted—it was rich, decadent, and intense. (As Tad would say, it was just like him.) At the same time, it was this crazy, dirty melting pot of so many things. You know how they say that NYC is like a beast that some people aren’t able to keep up with? This dish was just like that. I wonder if this dish qualifies as cheating hahaha. I don’t see how people can NOT enjoy eating it. Acai berry sorbet with mint. The texture reminded me of a mix between a sorbet and granite. 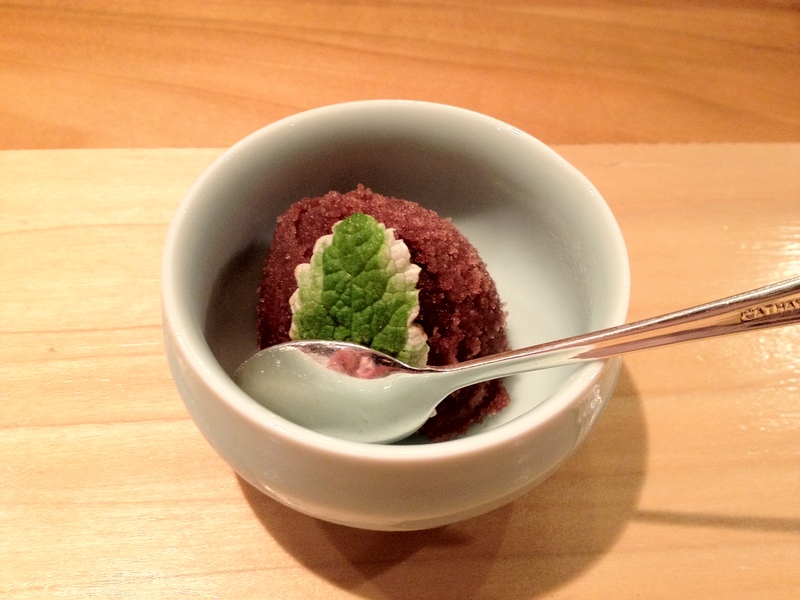 Chef Yamamoto called it a sorbet, though, so I’ll call it that. Anyway this was a welcome textural contrast to all the rich and creamy ingredients I just had! It wasn’t too sweet and tasted just like acai. After the meal ended, Chef Yamamoto chatted with us a bit and gave us his card, which had his personal cell phone number. If we ever want to make reservations in the future, we can just text or call him!